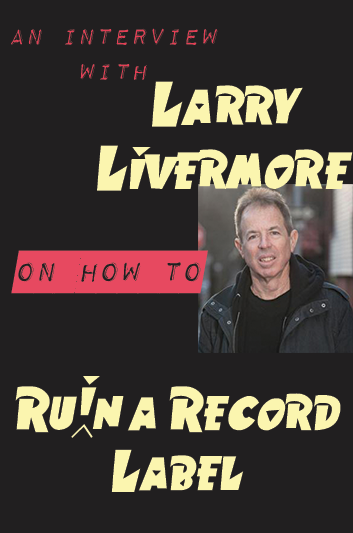 San Francisco Book Review Associate Editor, Steph Rodriguez, met up with musician, record producer, and author Larry Livermore at Well Grounded Tea & Coffee Bar in El Cerrito, Calif. to discuss the second installment of his memoir series, How to Ru(i)n a Record Label. Livermore and business partner, David Hayes, founded Lookout! Records in 1987, an independent record company based in Berkeley, Calif. that captured the East Bay punk rock sound. Lookout's roster of EPs and full-length records include bands like the Lookouts, Mr. T Experience, Operation Ivy (who would later form Rancid), Isocracy, Zero Boys, Screeching Weasel, The Donnas, The Groovie Ghoulies, Green Day, and dozens more.